EnterpriseDB (EDB), the Enterprise Postgres company, delivers an open source-based data management platform, optimized for greater scalability, security, and reliability. EDB is leading global provider of Postgres with 16 offices worldwide, EDB enhances Postgres making it enterprise ready. EDB Postgres makes organizations smarter while reducing risk and complexity with enterprise-proven management tools, security enhancements and Oracle compatibility. Over 4,000 customers worldwide including ABN AMRO, the American Automobile Association (AAA), Clear Capital, EMC, Ericsson, KT Corporation, MasterCard, the National Health Service (U.K.), Netflix, Nokia Siemens, S-Kreditpartner GmbH, Sony, Staples, the Nielsen Company, TransUnion, and U.S. Cellular have turned to EDB. Our customers come from a wide range of industries, including financial services, government, media & communications, and information technology. Our customers deploy diverse workloads including transaction processing, data warehousing, customer analytics and web-based applications, both on-premises and in the cloud. EDB Postgres Platform includes mission critical enterprise tools including failover manager, backup and recovery tool, and replication server. EDB platform and tools paired with 24/7 support, professional services, and training positions organizations for successful and efficient database management. EDB employees are leaders in the Postgres community including the co-founder of the Postgres Global Development Group and 2 of 5 PostgreSQL community Core Team. EDB provides our customers with long running, deep expertise to help them achieve their goals. 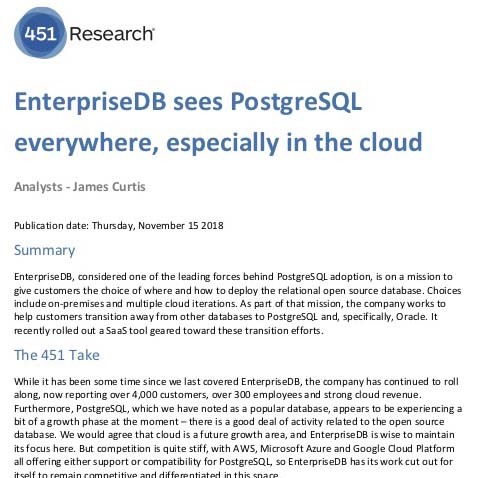 Industry analyst firm, 451 Research, issued this report providing an overview of EnterpriseDB, its history and recent product news including the EDB Postgres Migration Portal, EDB Postgres Ark DBaaS and Postgres Enterprise Manager.